Parker is an adorable and active toddler who was born on January 7, 2017. 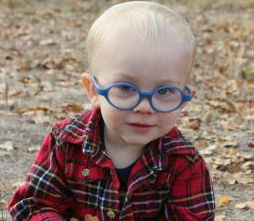 Just before Parker was around three-months-old, his parents noticed some significant changes in his eyes. His right eye had a glowing look to it, and his eyes did not seem to be tracking as they should. His concerned parents asked a few trusted friends, and were eventually pointed in the direction of a cataract and eye specialist. After having a thorough dilated eye exam, Parker’s parents were informed he needed urgent care, and they were referred to Portland. While in Portland an MRI was done, and it was discovered that Parker had a form of cancer in his eyes called, Retinoblastoma. Retinoblastoma is a rare cancer of the retina. It forms in tumor masses that can affect one or both eyes, and can also cause a child to be very susceptible to other forms of cancer. In Parker’s case, both eyes had tumors forming. The right eye had a tumor so large that he had to have his eye removed. It was also discovered that his left eye had four tumors growing, but they were small enough that doctors hoped chemo could eliminate them. Parker went through six rounds of systematic chemotherapy. The treatment looked as if it had accomplished the task of shrinking the tumors, but almost immediately, the tumors started growing back. Parker was then referred to a team of specialists located in New York. This team did three rounds of treatment called intra-arterial chemotherapy. So far, the treatment has proven to be effective, but he is still required to be under a watchful eye and have follow-up appointments. Parker is a happy little boy, and loves to interact with others. He is as fierce as they come. According to his parents, after the surgery that removed his right eye, he woke up, smiled, and laughed for the very first time. His joy filled the room and eased his parent’s emotions. Parker will be adopted as a Sparrow to Hedrick Middle School. Students at Hedrick will work hard to raise money for Parker through sponsored community service and fundraising projects.